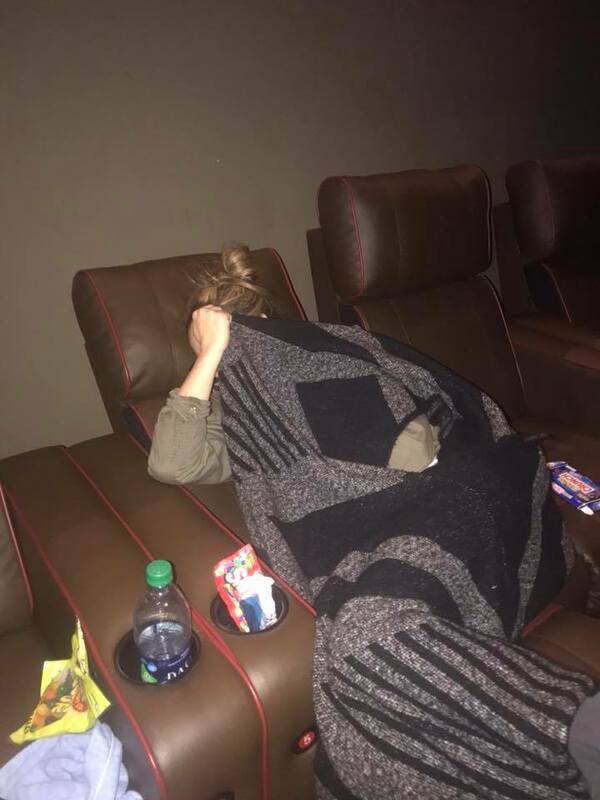 People, I just got back from seeing Infinity War and I’m not ok. I mean – I am legit not ok. I don’t even know how I made it back to my house. I think the Holy Spirit took control of the wheel and guided me back to safety because my soul is still in the theatre looking for some answers. I have been crushed. I have been incinerated. I have been toyed with and kicked to the curb. I’m telling you right now – if you choose to continue to read this post that you are going to find a ton of spoilers. So, do not read this post until after you’ve gone to see Avengers: Infinity War. I cannot be held responsible for ruining the movie for you. 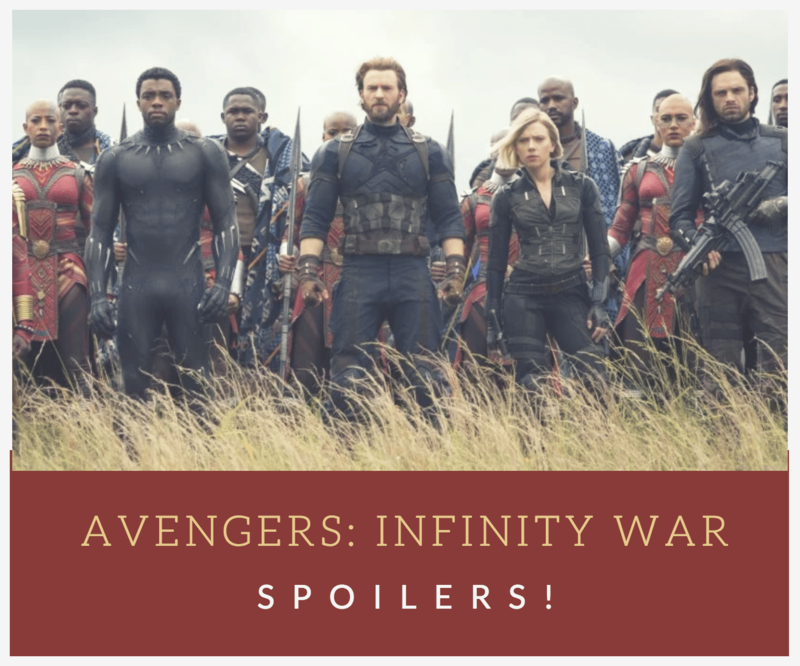 I literally am warning you right now that there are Infinity War spoilers in this blog. I’m not even writing at this point. Ever see one of those horror movies where a spirit possesses a person and she starts writing in Polish? That’s what’s literally happening right now. My head is spinning and I’m speaking in tongues while hanging from the ceiling. This is what Avengers: Infinity War has done to me. Also, Nutella doesn’t taste like anything anymore. So, what’s the point? I mean… what. is. the. point? I think I’m depressed. It’s really cold in here. Is anyone else cold? Here we go — turn back now if you don’t want to know. Gamora and Star-Lord finally kiss. What the hell? I know why they decided to do it here though and I’m not just saying that. I SERIOUSLY know why. I’ve been lucky enough to interview James Gunn a few times about Guardians of the Galaxy over the last two years. Throughout their shoots, the crew actually filmed several “first kiss” scenes but always cut them out because they always felt gratuitous. They never wanted to have “the kiss” because Hollywood expected it from the movie. 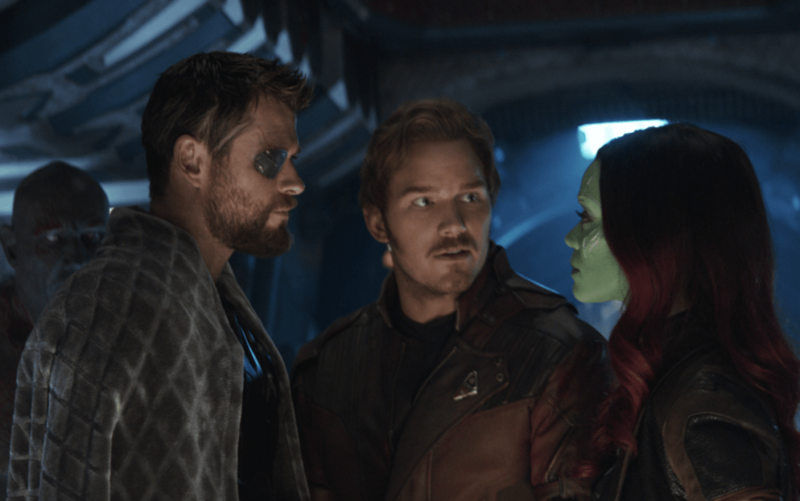 The fact that Marvel decided to put Gamora and Star-Lord’s kiss in the Avengers’ movie really fell in line with this story. It wasn’t forced. Gamora was begging him to kill her should she get captured again. That is some heavy stuff to swallow. Only someone who truly loves another would promise such a sacrifice. And believe me, that is a sacrifice because I’m not so sure I would be able to do it. Selfishly, I wouldn’t want to let go of someone I love THAT much. So, during this particular moment where Peter promises that he’d kill Gamora if she is threatened with capture, the two kiss. But it is shot in a way to portray that it wasn’t their first time. They kissed as if it was their millionth kiss. Kissed as it was just another scene in the story because that’s all it was. Just a part of their love. Not the whole story – just a part. We all know that Peter and Gamora have been in love for a very long time. This was just a second of that love. And for the kiss to be a part of Infinity War guaranteed no grand show. Because Avengers isn’t their stage. They were guests on the field. So, in an attempt to tone down the moment as much as they could, they literally had it happen in another movie. I can’t! Ok, stop. Hear me out. Thanos wasn’t really all about destruction for the sake of destruction. He was sort of doing it to save planets.. in his own way. Is that what I understood? He recognized that resources were sparse and so the only way to fix that was to make the hard choices. This isn’t the Avengers thought process or that of any human I know. HOWEVER, it wasn’t all about war either. From his perspective, it seemed like he thought he was doing some good. Again, I OBVIOUSLY don’t agree with him. OMG. But it felt like he thought he was doing these planets a favor. I guess that shocked me. I didn’t understand why Marvel went that route with him and didn’t keep him as a destroyer of all things? I didn’t warm up to him at all, but I guess I understood his mission more. We also saw that he actually loved Gamora in his twisted and demented way. He mourned her death. He cried right before he was about to kill her. He protected her from seeing all of her people get slaughtered. There was a fondness there – right from the start. He did consider Gamora as a daughter. I guess you could say that he loved as best as he could. He just needed a puppy when he was younger and maybe a little therapy. There was an ounce of good in him… it just wasn’t nurtured. I wonder if he is going to turn it around in another movie? I just don’t understand why they are playing up these characteristics? Is Thanos going to turn into a good guy? Who has read the comics before – does this happen??? Thanos and Gamora’s relationship proved hard to define – still after so many years apart. You saw in their scene together, they were very comfortable alone. Even though Gamora didn’t accept the meal he offered while she became his prisoner, she did talk to him openly and easily for some time. Their bond is complicated and not easy to define. Even though she tried to kill him, he still kept her. Even though she thought he died, she wept hard. Gamora wept because she was finally free of him. But I think she also wept for so many other reasons as well. Abusive relationships are cancerous. Unfortunately, she recognized that she wouldn’t be who she was today had he not made her that way. So, she mourned who she was. She hated him for who he was… and in some way, I guess she thanked him and was grateful for what he did to her. At least, that’s how I look at my horrible relationship with my nowhere-to-be-found father. Maybe I’m reading too much into this because I have my own experiences. I just watched that scene and understood hating someone so much, but also recognizing that deep down inside there are parts that were once loved as well. And just to add a little more – knowing that all the bad that has happened to a person can actually bring about some good. That mixed emotion is hard to accept. You are thankful and resentful. You are grateful and hateful. You are confused and self-aware. That scene was very tough for me. This part actually annoys me because we all know that because everyone dies… no one is going to stay dead. I mean, there is no flipping way that they just killed off a trillion dollars worth of movie making empires in one shot. Captain Marvel is going to swoop in somewhere around 2019 and team up with Thor and bring everyone back. HOWEVER, I don’t think that Vision is going to be making a comeback. I had a feeling he was going to kick the can. If you are a fan of Vision… I want to apologize for that link right off the bat. I sounded a little rude and I didn’t realize that until a friend sent me a text about it. So, I’m sorry. There – I said it. But honestly, Vision is too new for me to be invested in and if he is the one that has to die, so be it. GAH – I’m sorry again!!! I really am. Vision fans, forgive me. The whole 50% of the world evaporate thing… it was too much. I mean TOO MUCH. If they just left it that Loki and Gamora died – that would have flipped everyone out. But then Groot and Drax and Spider-Man and I mean… EVERYONE ON THE PLANET WHAT? It’s bananas. No way that is flying. We all know it. I am curious to see how they undo it. Dr. Strange is gone. So, he isn’t going to be the one to wield the stone’s power? My freaking boyfriend is gone. This is probably the number one reason why I know none of this will stick. Because everyone on the planet knows that Guardians of the Galaxy 3 is filming. How can they film without 75% of their team?????? Um… where the hell was Hawkeye? And Ant-Man’s witty humor? The Wasp? I thought we were rounding everyone up? I guess they didn’t get the memo about the biggest fight in Earth’s history. I found that a little strange, right? I mean – you have EVERYONE at the prom. Literally everyone. Except for three people? Just get a little more budget and throw the cranberries into the trail mix. Let’s go?! Also – am I crazy or was Hawkeye in all the posters or something? Did I remember seeing something like that? I’m just confused. My guess? These characters will be in Avengers 4. 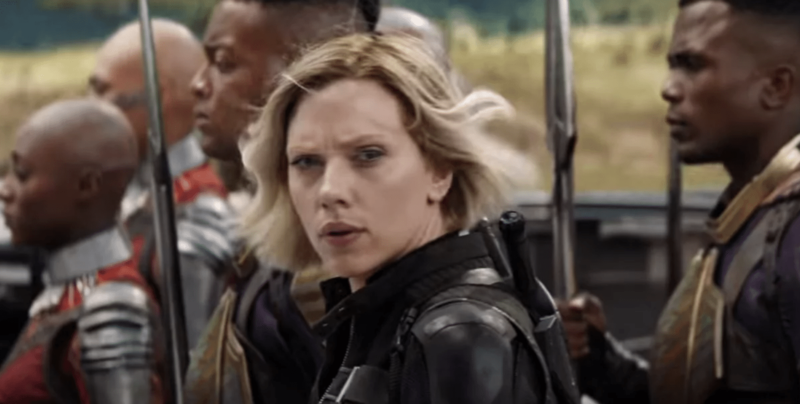 Will Avengers 4 come out earlier than expected? All of this needs to wrap before the slated next releases to all of the next follow-ups to Spider-Man, GOTG, Dr. Strange etc. etc. etc. So, Marvel is on a time crunch!!! I wonder if they are just messing with us. The guy is rich. Has some hella tech. 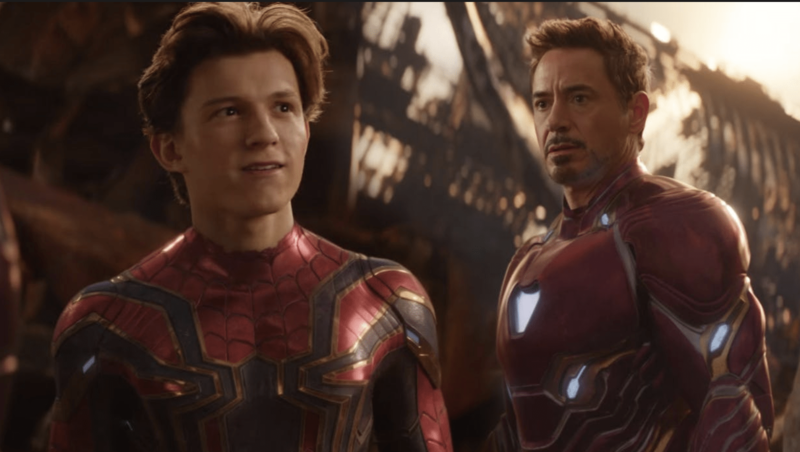 Basically outfits both The Hulk and Spider-Man throughout the movie and power suit changes his way through one heck of a fight scene with Thanos… and still makes it out on the other side. I thought he was going to die during his final scene. Did you? I was actually holding my breath thinking WOWOWOWOWOWO – HIM TOOO? But no. He offers too much comedic relief to the audience. We can’t lose him just yet. This is the first time that Bruce Banner cannot turn into The Hulk – at will – at all throughout the movie. 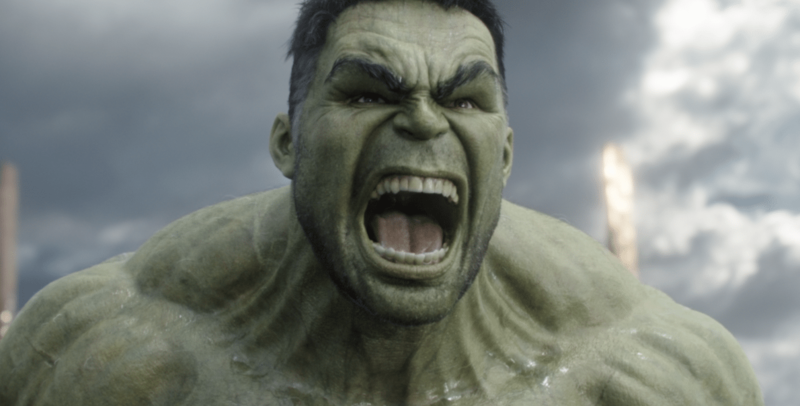 No matter how much he begs, The Hulk refuses to fight Thanos and his army. I don’t know if it is true or not, but my guess is that The Hulk finally met his match in Thanos. Maybe when he got slammed down to the ground during their first fight, he realized that he met something truly more powerful than him, and that was enough for him to not want to try it again. I don’t know whether or not it’s true… but if I had to guess that’s what I would say. The only way we are going to see the Hulk is if someone he truly loves falls in harm’s way and we know who that is. Infinity War Spoiler: Who Will Resurrect All The Fallen Superheros? I don’t know much about him… but my guess is Adam Warlock will do the resurrecting. There are only a few people left. I know that Infinity War left us thinking that Captain Marvel is going to come to the rescue and I am certain that she will play a part. Perhaps even Hawkeye, Ant-Man and the Wasp? Who knows? 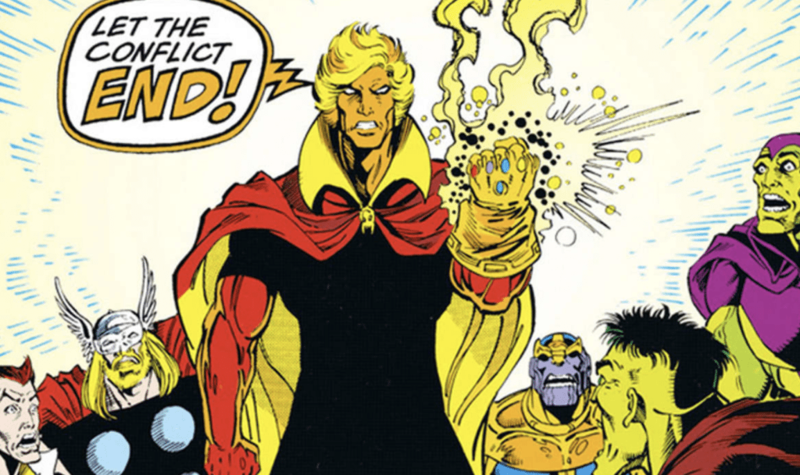 But there was such a STINK about Adam Warlock last year. That he was this bigwig. I don’t know much about him honestly, but when I searched his name… look at what I found. A picture of him wearing what? Thanos’ Infinity Stone Glove thing. I don’t feel like looking up the name. It’s super late. Just go with it. Oh, yes I said it. There is no flipping way that she is dead. NO WAY. I would even go crazy and argue that everyone that Thanos killed is trapped in the Soul Stone. So, if Captain Marvel could just get her hands on the Soul Stone… she could unleash all of their souls and bring them back to life. Why do I think this? Ok – let me tell you! Why did Thanos speak to a little girl version of Gamora? Why? Because she’s not dead? She is trapped in some alternate universe that he created to keep all the souls. Or maybe the Stone did. With all the stones working together – that’s how they merge their powers. So, the Soul stone takes their lives and the Space stone holds them. Or maybe the Reality stone holds them? I don’t know how the writers are going to word it – but that’s how it works. The Time stone keeps them in place. It all makes sense. Whoever controls all the stones also controls all the souls. When the Avengers or when Stan Lee or whoever the hell they decide will FIX THIS does so in 2019, they have to gain control of the glove thing. Please don’t make me look up the name. Another option is to go back in time with the Time Stone and try to redo the whole thing but that’s just exhausting. I don’t know if they will decide to do that. I think the better bet is just to release the souls. It feels right. BUT what movie will they do that in? Captain Marvel? Ant-Man? Which one are they betting on? It’s gotta be the Captain Marvel one because the company is making a big stink out of it. They are probably going to put a lot of money behind it. Did I miss anything? I’m exhausted? I had to release this. I have hives on my neck. I’m really stressed out. This needs to get resolved. I’m not ok. All of this needs to happen already. I can’t live with my boyfriend being a pile of dust. How can I make out with a pile of dust at night? That’s just weird. Marvel – do something!! Put out a short or something. Like a 20-minute film and release it in theatres and charge us all full price and we will all pay. Just fix this. I can’t wait a year. I feel sick. Infinity War has wounded me. I just paid $86 for all of my family to go so I can spend the rest of the night feeling sick. Something isn’t right. Ok, one more section before I wrap this puppy up. Loki should stay dead. Sorry – not sorry. He can’t be trusted. When they bring him back… he is just going to screw with everyone anyway. Keep him down, Thor! He done did you wrong so many times. Gamora should stay dead because then I have a chance to get cast as Peter Quill’s alien girlfriend. When he gets resurrected, we can both privately ride off in our spaceship and find a nice uninhabited planet and make half-god babies together. It’s gonna be amazing. Obviously, anyone who turned to ash has to come back because that was all just too much. But I really do think if they truly died in the film, they should stay dead. I just watched Justice League on the plane to Florida and Superman came back which I was happy about because I really like the actor as a person but things like that are not fair to the viewer. You really play with our emotions when you bring back the dead. I mean… they are DEAD. Like… dead. I know it’s superhero stuff, but there’s gotta be a galactic line in the sand. Who Will Probably Stay Dead? Ok, people. Here’s some real hard truth. I’m traumatized because I know this is a mean school prank. Marvel is waiting for me to sit down in my chair while the execs in the back watch. Right when I’m about to get comfortable they’re going to pull the chair and watch me fall. It’s all a joke. A mean joke. I’m upset because I literally know that none of this is true. I’m not upset because all these people are dead. I’m upset because none of these people are dead. Like… none of them are dead. That’s the part that is hurting my brain. Even Loki… Thor says in the movie that his brother has died before and it’s not his first time experiencing that kind of loss. Gamora was seen as a child right before the movie ends giving the audience a glimmer of hope that a piece of her still exists. Forgetting all of that – the Soul Stone is the key! Everything that was done can be undone. There is too much money on the table. This is a cold hard fact. So, why are you torturing me??????? I’m not happy. To be honest with you, I would be less upset if all those people actually died. Ok, that’s not true. But you know what I mean. Don’t do things to just undo them. Don’t do things knowing that they are already undone because Ant-Man and Captain Marvel and Avengers 4 and GOTG3 are already written and so those peices are already in place. Don’t string me around like this. What did I ever do to you??????? People better be dead and stay dead in 2019. That’s all I’m saying. Give me at least one person. I will be happy with one. Dealer’s choice. Have you seen Avengers: Infinity War yet? What did you think? Tell me everything!!!!! I think Captain Marvel is a woman and not a man in these Avenger movies. I could be wrong but I believe it is a woman. Oh, and I wonder if Dr. Strange gave up the stone not to just save Iron Man but because they had to play out the ONE scenario that he saw them win out of the over 1000 he saw in the future. Just a thought. I had so many questions from a practical standpoint. 1) Why didn’t they just like chop Thanos’s hand off? 2) Now with all of the stones, Thanos can do anything he wants. 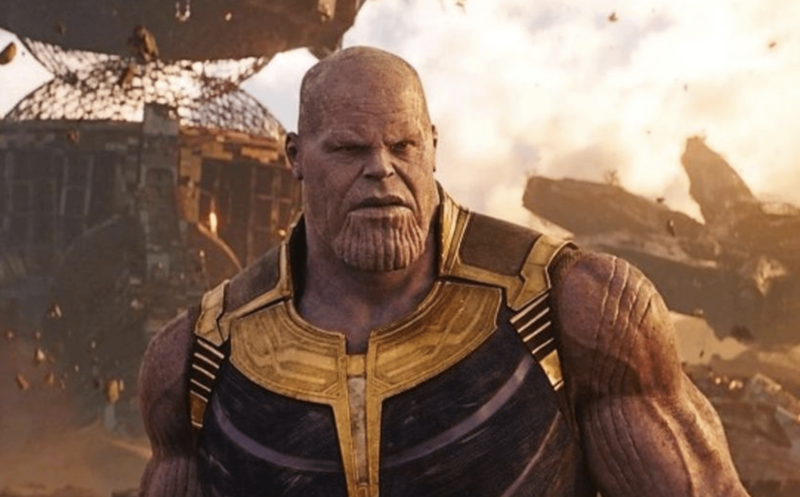 So…why didn’t he snap his fingers and make DOUBLE THE RESOURCES on all the planets instead of making half the people die? Hello what? 3) Why in the devil would Benedict Cumberbatch give up the time stone when that is literally his only purpose (to guard it) and only source of power. 4) Why is Loki so bad at fooling people? I mean I wouldn’t have fallen for that crap either.